Voting has begun in Westminster’s search for the city’s best building of the last decade, recognising the capital’s cutting-edge architecture with a design excellence award. Westminster is home to some of the country’s most famous buildings and landmarks. To recognise, celebrate and promote architectural excellence across the city, Westminster City Council (WCC) has launched the first People’s Choice Award. The award has been launched as part of a broader campaign to engage the public in a debate about what makes a great building, recognising cutting edge, high quality designs from the past 10 years. An expert panel comprising of experienced architects, developers, councillors and planners has shortlisted 12 designs and now those who live, work and visit the city can vote for their favourite modern building. The panel considered each building’s use of materials, its purpose and impact on the space around it when making the final selection. The shortlist is made up of buildings which serve all parts of the community with housing, office, retail, education and gallery space all put forward for the public to vote on. The award is being led by Councillor Robert Davis MBE DL, Deputy Leader of Westminster City Council. He said: “From sleek glass art galleries to outstanding housing developments, each of these buildings finds inventive solutions to unique architectural challenges. “Brilliant architectural design should be recognised for all the fantastic benefits it can have in terms of health and wellbeing, sustainability, and the simple pleasure we all take from having such striking buildings lining our routes home and to work. “The best people to ask about the impact these buildings have are those who see them day in, day out, and so I am delighted that we have been able to engage the public in a debate about what makes a great building and to promote design excellence,” explained Cllr Davis. The Serpentine Sackler Gallery opened in 2013, welcoming visitors from around the world to its many programmes exploring contemporary creativity. In 2010 the Serpentine Gallery won the tender from The Royal Parks to bring the listed Magazine building into public use for the first time in its 208-year history. 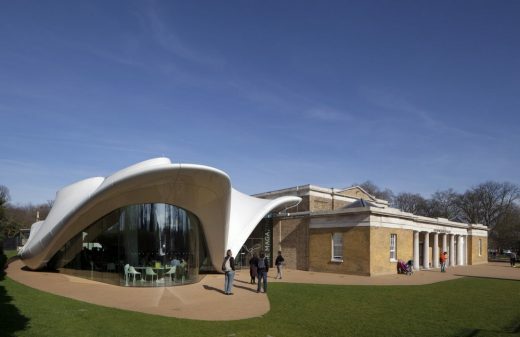 In partnership with The Royal Parks, the Serpentine Gallery has restored the building, renovating and extending it to designs by Zaha Hadid Architects. Built in 1805 in London’s Kensington Gardens as a gunpowder store during the Napoleonic Wars, the Magazine building has been renovated and repurposed into the Serpentine Sackler Gallery – one of London’s most popular spaces for art. A light and transparent extension complements the solidity of the original neo-classical building. Championing new ideas in contemporary art for almost half a century, the Serpentine Galleries have presented pioneering exhibitions of more than 2,000 artists, showing a wide range of work from emerging practitioners to the most internationally recognised artists and architects of our time, including Zaha Hadid herself. An exhibition of Zaha Hadid’s art is to be staged at the gallery she converted for the Serpentine. The show at the Sackler in Kensington Gardens was conceived by Hadid and the gallery’s curators before her death in March aged 65, reports Building Design. Rarely seen paintings, drawings, calligraphy and digital work will go on display this winter. Hadid had a long relationship with the Serpentine, becoming a trustee in 1996, and designing the inaugural Serpentine Pavilion in 2000 – her first structure in the UK. She completed the Serpentine Sackler Gallery extension and conversion of a grade II* gunpowder store into a new gallery for the Serpentine in 2013. It is here that the exhibition will be held from December 8 to February 2017. A statement from the Serpentine said Zaha was “widely regarded as a pioneering and visionary architect”. “She was also an accomplished artist and highly skilled calligrapher, influenced by Malevich, Tatlin and Rodchenko,” it said. The finish reminds me of the Chanel Pavilion by ZHA which I saw in Paris last year. I’m a big fan of more natural materials such as wood, stone and yes, concrete! Glass and metal of course have supreme moments too but all these moulded grp, grg, etc. envelopes can at times be hard to engage with. The architects describe the extension as being ephemeral, but it doesn’t have the soft translucency of a Frei Otto tent or indeed the Mound Stand by Hopkins in London. It doesn’t feel light enough for me. 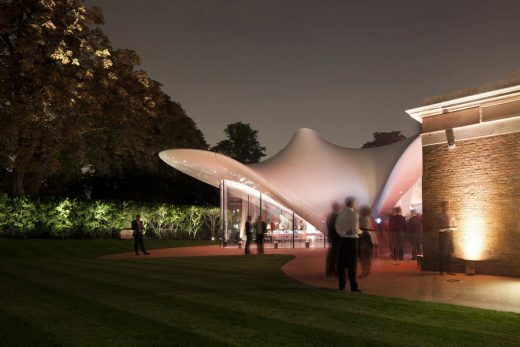 The Serpentine Sackler Gallery consists of two distinct parts, namely the conversion of a classical 19th century brick structure – The Magazine – and a 21st century tensile structure. The Serpentine Sackler Gallery is thus – after MAXXI in Rome – the second art space where Zaha Hadid and Patrik Schumacher have created a synthesis of old and new. The Magazine was designed as a Gunpowder Store in 1805. It comprises two raw brick barrel vaulted spaces (where the gunpowder was stored) and a lower square-shaped surrounding structure with a frontal colonnade. The building continued to be in military use until 1963. Since then Royal Parks used the building for storage. The Magazine thus remained underutilised until now. Over time, much amendment and alteration has occurred inside the historic building and its surroundings. Instrumental to the transformation into a public art gallery was the decision to reinstate the historic arrangement of the Magazine building as a free standing pavilion within an enclosure, whereby the former courtyards would be covered and become internal exhibition spaces. In order to reveal the original central spaces, all non-historic partition walls within the former gunpowder stores were removed. The flat gauged arches over the entrances were reinstated whilst the historic timber gantry crane was maintained. Necessary services and lighting were discreetly integrated as to not interfere with “as found” quality of the spaces. These vaults are now part of the sequence of gallery spaces. The surrounding structure has been clarified and rationalized to become a continuous, open sequence of exhibition spaces looping around the two central powder rooms, thus following the simplicity and clarity of Leo von Klenze’s Glyptothek as an early model for a purpose built gallery. What was a courtyard before, became an interior top-lit gallery space. Longitudinal roof lights deliver natural daylight into the whole gallery sequence surrounding the central vaults and with a fixed louver system they create perfectly lit exhibition spaces. Retractable blinds allow for a complete black-out of the galleries. The continuous sky-light makes the vertical protrusion of the central core of the building (containing the two vaults) legible on the inside. These reconstructions and conversions were designed in collaboration with heritage specialist Liam O’Connor and in consultation with English Heritage and Westminster City Council. In addition to the exhibition spaces the restored and converted Magazine also houses the museum shop and offices for the Serpentine’s curatorial team. The extension contains a generous, open social space that we expect to enliven the Serpentine Sackler Gallery as a new cultural and culinary destination. The extension has been designed to complement the calm and solid classical building with a light, transparent, dynamic and distinctly contemporary space of the 21st century. The synthesis of old and new is thus a synthesis of contrasts. The new extension feels ephemeral, like a temporary structure, although it is a fully functional permanent building. It is our first permanent tensile structure and realization of our current research into curvelinear structural surfaces. The tailored, glass-fibre woven textile membrane is an integral part of the building’s loadbearing structure. It stretches between and connects a perimeter ring beam and a set of five interior columns that articulate the roof’s highpoints. Instead of using perimeter columns, the edge beam – a twisted ladder truss supported on three points – dips down to the supporting ground in front, in the back, and on the free west side. On the east side this edge beam (and thus the roof of the extension) swings above the parapet of the Magazine. A linear strip of glazing gives the appearance that the roof is hovering above the Magazine without touching. The Magazine’s western exterior brick wall thus becomes an interior wall within the new extension without losing its original function and beauty. This detail is coherent with the overall character of the extension as a ‘light touch’ intervention. The envelope is completed by a curved, frameless glass wall that cantilevers from the ground to reach the edge beam and fabric roof. The interior of the new extension is a bright, open space with light pouring in from all sides and through the 5 steel columns that open up as light scoops. The anticlastic curvature of the roof animates the space with its sculptural, organic fluidity. The only fixed elements within the space are the kitchen island and a long smooth bar counter that flows along the Magazine’s brick wall. The tables, banquets and chairs are designed as a continuous Voronoi pattern, reminiscent of organic cell structures. Our aim is to create an intense aesthetic experience, an atmosphere that seems to oscillate between being an extension of the delightful beauty of the surrounding nature and of being an alluring invitation into the enigma of contemporary art. The Serpentine Sackler Gallery, designed by Pritzker Architecture Prize laureate Zaha Hadid, will open to the public on Saturday, 28 September 2013. The Serpentine Sackler Gallery gives new life to The Magazine, a former 1805 gunpowder store, located five minutes walk from the Serpentine Gallery on the north side of the Serpentine Bridge. 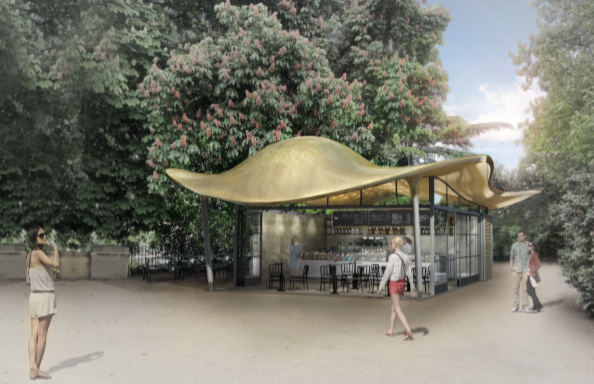 With 900 square metres of new gallery, restaurant and social space, the Serpentine’s second space in Kensington Gardens will be a new cultural destination in the heart of London. From this autumn, the Serpentine will present its unrivalled programme of exhibitions and events across both Galleries and into the Park. Widely acknowledged as one of the most important architects coming to prominence worldwide, Sou Fujimoto is the leading light of an exciting generation of artists who are re-inventing our relationship with the built environment. Inspired by organic structures, such as the forest, the nest and the cave, Fujimoto’s signature buildings inhabit a space between nature and artificiality. Fujimoto has completed the majority of his buildings in Japan, with commissions ranging from the domestic, such as Final Wooden House, T House and House N, to the institutional, such as the Musashino Art Museum and Library at Musashino Art University. Serpentine Pavilion 2011 by architect Peter Zumthor. The Serpentine Gallery are having their 8th annual Marathon in their acclaimed festival of ideas on the 18th and 19th of October during Frieze week. It is the first public event to take place in the new Serpetine Sackler Gallery and Zaha Hadid extension and will bring together more than 60 renowned artists. The theme is 89 Plus this year, inspired by the multi-platform research project by the same name, co-founded by Hans Ulrich Obrist and Simon Castets, which is conceived as a mapping of the generation born in or after 1989. Participating this year is Zaha Hadid and also Ou Ning, chief curator of the 2009 Shenzhen & Hong Kong Bi-city Biennale of Urbanism and Architecture. Over two days (18/19 October), during Frieze Art Fair, Serpentine Galleries stages the 89plus Marathon, the 8th Festival of Ideas, conceived by the Galleries Co-Director Hans Ulrich Obrist, originally inspired by the annual Pavilion Commission, invented by the Galleries Director Julia Peyton-Jones in 2000. Every year since 2006, the Serpentine has invited the most diverse array of world-leading figures to investigate one topic from all angles over an intensive two-day period. Past Marathons have covered subjects ranging from Manifestos (2008) and Maps (2010) to Memory (2012). In 2013, the 89plus Marathon takes its name and theme from the multi-platform research project 89plus, co-founded by Hans Ulrich Obrist and Simon Castets, which investigates innovative work the generation born in or after 1989. Following the Memory Marathon in 2012, the 89plus Marathon looks to the future and considers how the internet and new social, political and economic networks are changing the world as we know it. Leading artists, writers,musicians, scientists, entrepreneurs and political activists – born in or after 1989 – come together with world-renowned figures of all generations for a weekend of performances, screenings and debates. It will be the first major public event to take place in the new Serpentine Sackler Gallery, designed by Zaha Hadid Architects. Those born since 1989 have grown up in a networked society and in an evolving global economy; they belong to a generation whose voices are only starting to be heard, yet are already shaping the world in which we live. The 89plus Marathon offers a moment in time for some of the brightest lights of this generation – who make up almost half the world’s population – to come together with their peers and mentors to consider what the future will look like and, crucially, who will determine that future. Among many issues and questions, the 89plus Marathon will investigate whether new technologiescan lead to a global dialogue that will engender difference rather than homogeneity; the effect of growing up during a global economic crisis; how the internet has enabled new forms of political protest and, a question that runs as a motif throughout, who is responsible for the future? Among the sixty participants confirmed so far are Halil Altindere, whose video Wonderland was a highlight of the 13th Istanbul Biennial; Generation X author and Marathon veteran Douglas Coupland; programmer and entrepreneur Nick D’Aloisio, who at the age of 17 sold his search optimisation tool Summly for an estimated $30 million; former member of Anonymous and LulzSec groups Jake Davis; trend forecasting group K-HOLE; rapper, producer and Youtube phenomenon Le1f; Icelandic information freedom activist Smári McCarthy; writer and curator Kevin McGarry; artist Felix Melia, who will be experimenting with social media to create and stream a film live at the Marathon; neuroscientist Kathryn Mills, who will talk about the effect of the internet on the adolescent brain; Zachary Sims, founder and CEO of Codecademy and advocate for lessons in computer science and programming as a core part of the school curriculum; and artist Hito Steyerl, one of the most influential thinkers on digital culture. The 89plus Marathon stage will be designed by artistAmalia Ulman. Audiences can attend specific events – ranging from 15-minute presentations to hour-long performances – or immerse themselves in the entirety of the two-day festival. For the first time, an online 89plus Clubhouse, hosted by HP Cloud, will enable remote participation from anywhere in the world. The 89plus Marathon is curated by Hans Ulrich Obrist, Co-Director Serpentine Galleries and Co-founder of 89plus; Simon Castets, Director and Curator of Swiss Institute Contemporary Art New York, and Co-founder of 89plus; Ben Vickers, Curator of Digital at Serpentine Galleries; and Jochen Volz, Head of Programmes at Serpentine Galleries. In previous years the Marathon has been co-hosted by Rem Koolhaas and Olafur Eliasson.